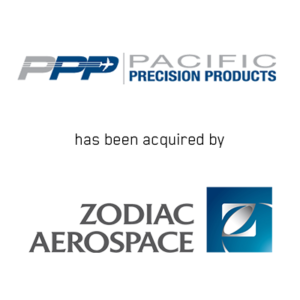 Irvine, CA (February 28, 2014) – Janes Capital Partners is pleased to announce the sale of Pacific Precision Products (PPP) to Zodiac Aerospace. Located in Southern California, PPP is a leading developer and manufacturer of oxygen systems and components for mid and large-cabin business jet original equipment manufacturers (OEMs) and completion centers. Janes Capital Partners served as the exclusive financial advisor to Pacific Precision Products Mfg. The Janes Capital Partners deal team included Stephen Perry, Managing Director, Jason Wright, Senior Vice President, Ilana Germaine, Associate and Travis Mullen, Analyst. Rutan & Tucker acted as legal counsel for PPP. Kilpatrick Townsend & Stockton LLP and Approbans acted as legal and financial counsel, respectively, for Zodiac Aerospace.